The following methods have been used successfully to calculate vapor loads, replacing the extensive calculations and laboratory tests that might otherwise be required when a designer considers a new space humidity problem or application. Actual data from moisture loads entering a space through walls, floors, and ceiling are available for various moisture loads and classes of construction. 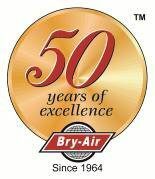 For standard types of construction, Bry-Air has determined values for calculating the moisture load entering a space at controlled humidity levels. Usually these calculations are relatively easy. The following tables are aids for load calculations. Outside humidity levels shown in Table I are deliberately higher than data for design specifications. This compensates for days when the design wet-bulb temperatures are reached and the design dry-bulb temperatures are lower than expected (thus creating higher total humidity). Use the area design wet-bulb and the specific humidity figures shown here to accurately rate the moisture control situation. Further information on design can be found in the ASHRAE Fundamentals Handbook, “Weather Data and Design Considerations”. Each pound of air entering the space will impose a moisture load determined by the difference in interior and exterior moisture content. Since the vapor pressure differs as the moisture content, the vapor will move at a higher velocity than the air. The combination of the two factors, results in the space moisture load increasing at an ever increasing rate as the difference between the interior and exterior moisture contents increase. In view of the above, the F1 factor is used to adjust for the increased vapor velocity. Therefore, the combination of the F1 and F2 factors represent the space moisture load anticipated from both permeation and infiltration. If the product of F3 x F4 is less than 0.5, use 0.5. If the room is completely vapor proofed, with continuous vapor barrier under the floor (or of all­metal, welded material) the factor may be reduced to 0.3. To determine the grains of moisture penetrating the construction into a controlled space, use the following calculation. C x ∆G x F1 x F2 x F3 x F4 = Grs/hr. (To determine grains/minute divide answer by 60). = Amount of vapor able to permeate the closed space through construction and vapor barriers. C=14 = constant used to translate ft.3 to pounds. This constant is used regardless of the density of the air. G = difference between the grs/lb of outside air and the grs/lb desired in the controlled space. F1 = moisture difference factor (Multiplier from Table II). F2 = Permeation factor (Multiplier from Table III). Problem- Find the amount of moisture that will permeate the room defined below. Room with 12″ masonry walls. Two coats of aluminum paint as vapor barrier. C x ∆G x F1 x F2 x F3 x F4 = Grains per hour. G = 130 – 40 = 90 Problem stipulates 40 gr/lb in the room;therefore, 130 – 40 = 90. F1 = 2.29 From Table II (Factor for a moisture difference of 90 gr/lb). F2 = 0.58 From Table III Locate 22,000 on bottom line. Travel up and readcurve at 0.58. When openings as service or personnel doors are opened periodically, moisture-laden air can enter the conditioned space. Also, vapor is constantly seeking drier space and will seep around and through doors, even when they are closed. A = area of the door opening in square feet. G = difference in specific humidity in grs/lb between controlled space and the adjacent space. See Table I for outside wb to determine adjacent specific humidity. F1 = factor from Table II for moisture difference. 7 x 90 x 2.29 = 3710 grains per hour added to controlled space. Note that if the door is open for longer periods, use the calculation scheme below. F1 = Moisture Difference Factor from Table II. Population load. People working in an area add moisture to the air because of breathing and the evaporation of perspiration. When animals occupy the controlled space, moisture release is contributed by their excrement. For animals, weigh the amount of water consumed during a given period and assume that much water will be eliminated. Product load. Any material manufactured in a controlled area can bring moisture with it and then release the moisture into the work area. Material brought into a warehouse tends to become drier; it gives up moisture over a period of time and loads the drying equipment accordingly. All materials should be suspect. For ex­ample, most metals bring very little moisture, but nonmetals can carry surprisingly large amounts of water. The material’s supplier should have information on its moisture carrying characteristics. If such data are unavailable, a simple test should prevent an unexpected and substantial moisture load problem. Place a sample of the material in a small, dry container or place some material in a tall hopper and blow air over it to dry it. Measure the moisture loss over an appropriate time interval to determine its dwell time, or how fast it gives up moisture. In some cases, a small pilot plant can be used to acquire definite data. Process load. The manufacturing process itself may expel moisture into the atmosphere of a controlled space. Open tanks or trays of liquid will add to the moisture load. Other contributors include open steam exhausts, unvented combustion cycles, and aging or curing cycles. Ventilating or make-up air from the outside contains moisture that must be removed. Some designers add this moisture load to the total calculated internal load to determine the required capacity of the drying equipment. 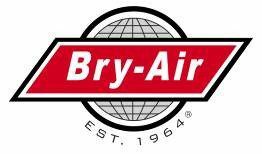 However, Bry-Air recommends this air not be considered part of the internal load. Rather, it should be considered at its point of entry. If this added, or make-up air from outside mixes with the return air and all go through the dehumidifier, then it is not added to the internal moisture load. But if only part of this outside/return air mixture passes through the dehumidifier, then the part bypassing the dehumidifier must be added to the internal load of the room. The added air is only part of the total air used in controlling space humidity. Since it rarely gets into the controlled space without first going through the dehumidifier, consider it at its point of entry-at the dehumidifier. Among the normal elements of an air drying system, the air entering the drying equipment is a mixture of return air from the controlled space and make-up air from the outside. The temperature and moisture content of this mixture depend on its two contributing air streams. Moisture-laden air enters through the process inlet and moves through the desiccant media. The desiccant adsorbs the water vapor and the dehumidified air is then delivered through the process outlet directly into the controlled space or air stream. Then, as the desiccant media rotates into the reactivation air stream, the hot air entering through the reactivation inlet drives off the moisture and exhausts it into the atmosphere. After reactivation the hot, dry desiccant rotates back into the process air stream where a small portion of the process air cools the desiccant so that it can begin the adsorption process allover again.